Curvy and compelling, the modern-looking Star Trac Pro Treadmill offers an array of user-friendly features that will make your time on the tread more enjoyable. Designed in conjunction with DesignWorks USA, a BMW affiliated company, this treadmill creates an intuitive atmosphere to run in that is truly advanced. To begin with, Star Trac Pro utilizes the Soft Trac® suspension system, with three cushions instead of two, which is a step forward from the Impact Absorption System. 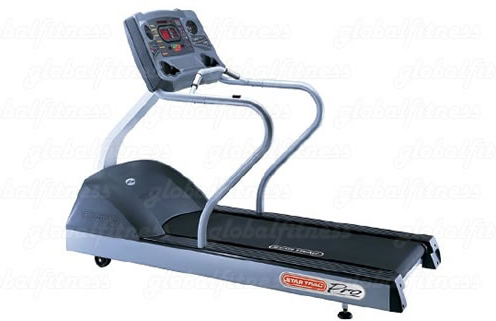 It offers dual-cushioned arm supports and an AeroBar, not found on most commercial-quality treadmills. The display console is likewise intuitive, automatically eliminating unnecessary data during the program, which only slows you down as you work. There are diamond-plated foot-plates on each side of the treadmill, which provide body-weight data if desired. And you won't overheat, as the Star Trac Pro has two personal fans mounted on the display and a dynamic iPulse™ System, which keeps you in your specified training zone. Not content to workout on your own but can't afford a personal trainer? The Star Trac Pro offers several Workout Partner options –Athletic Partner, Climbing Partner, or Weight Management Partner. In addition, up to 50 different personal trainers can input their own programs into the machine with the Personal Trainer Studio option. You'll really know you're using up-to-the-minute technology when you engage the Pro Partner feature, which beams data from your workout directly into any device compatible with a Palm OS, such as a PDA. There are multiple pre-programmed courses to choose from on the Star Trac Pro, including 5 and 10k challenges, progressive hill workouts, and a varied-profile program. In fact, you can mix these options up to produce up to 250 different challenges. Dimensions: 85.5" X 34" X 65"